This is the fifth most visited tourist attraction in the UK. By day, it offers excellent views of the city. However, the best time to see the pier is when it is lit after nightfall by thousands of light bulbs. 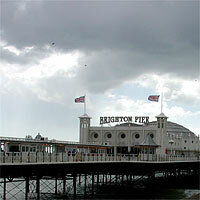 The first pier was built as a ferry terminal. 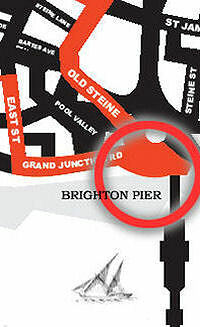 Brighton offered the quickest ferry route to Paris. The original Chain Pier was built in 1823 but destroyed in a storm in 1897. Piers became places to take the sea air. Breathing ozone was healthy, but going out in small boats was uncomfortable. So fashionable visitors walked out on piers, dressed up in their finest clothes, to see and be seen. That’s why pier seating faces the walkways, rather than the waves. Just wondering if anyone knows what the oldest surviving part from the 1890s is on the Palace Pier? looking around it today it seems most of the original parts have been removed. I wonder what happened to all the decorative arches? Does anyone know about Gypsy Rose Lee of Brighton Pier? I think her real name was Sarah Pol Lee, or sometimes Mary Smith. It would be good to know anything, please email me at kellyhoward82@yahoo.co.uk. Thanks. There was another colourful character that I think was associated with the Palace Pier in the 1950s and 60s, “Eva Petrulengo” who billed herself as a “Genuine Gypsy Clairvoyant” although I have no idea where she really came from and it is unlikely this was her real name. I would love to hear more about her and please email me at a.p.baron@usa.net if anyone happens to know anythng about her. I worked in a clothes shop at the bottom of St. James’s Street about 1959, it ws called ‘Pigalle’. Eva Petulengo worked with me in the winter when the fortune telling business was quiet. I think we called her Julie. She read one of our staff’s hands and told him he would have twins. He already had, unfortunately not with his wife!